A busy, more efficient print shop needs never-say-die, and a printer that can deliver quality output at higher speed. Meet the new WER-E3055T phone case printer. With original EPSON printhead and a rigid new industrial design, productivity and quality are built inside. The E3055T runs with new professional water-based textile ink , which is available in 4 or 8 colors and cartridges that cost up to 35% lower than the competition. The result? High-volume, low-maintenance printing and bold, exciting colors with higher profit margins. 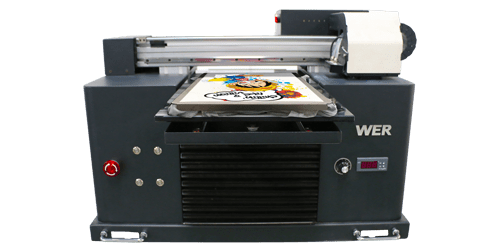 A3 WER-E3055T Tshirt Printer with one dx7 print head. Original Epson R3055 printing system, which is equipped with original EPSON Piezo inkjet TX800 Printhead. Traditionally people use sublimation printing to custom print t shirts. With this way, shortcomings are very obvious: only white shirts can be printed and hard hand feel. Now with E3055T, these problems can be very easily solved. It is able to custom print any color t shirts with simple operation. And it has a very competitive price, everyone can afford it.